I came across a very creative lady at a blog that took the idea of the shelf and ran with it. You can read about her adventures HERE. I tried using the dimensions she listed and they were a great starting point...but I really wanted mine to match up more to the shelf I already bought. And you may wonder how I managed to build this handy dandy shelf without spending a fortune on wood, saws and sanders? That's simple....FOAM BOARD. I thought it sounded lame and cheap at first. But, really all it was...was cheap! It's much sturdier than you would imagine. I don't think it's so lame. Do you? The one on the left is mine. Yes, it's not as pretty as the one I bought, and the dimensions are not perfect because I am math challenged, (please don't look too close at that first shelf) but the Foam Board cost me a whole $1.97 and I already had a craft knife and hot glue gun. 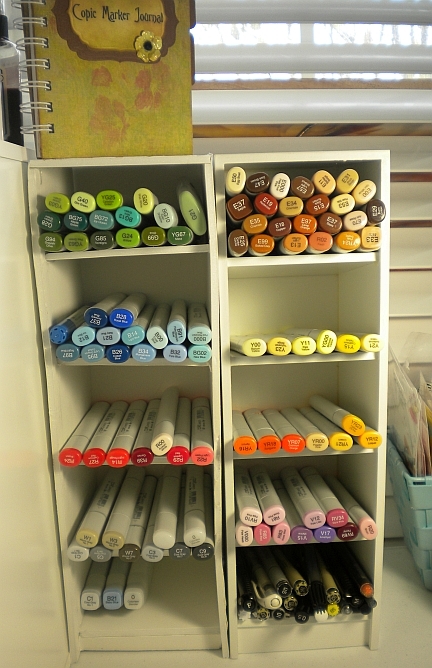 Now...I have room to fill it up with more Copic Markers. YAY! And if I get too crazy...I can always build another shelf! Your Copic holder is great. Before you told me differently, I thought the one on the right was your homemade holder. I don't know enough about the Copic markers and storage and thought the one on the left had a smaller space at the top for the pens, I think they are blenders or white or something like that. This is just the incentive I need to use my foam board for a homemade ink pad holder and for that I say thank you! Keep up your beautiful work! Great job , I did the same thing with poster board and I love it! !